But, that aside, one of my favorite things to nom on is their 7-grain bread. It's amazingly soft yet has so much texture from all of those hearty grains. This recipe isn't theirs, apparently their recipe is top secret pshhh! 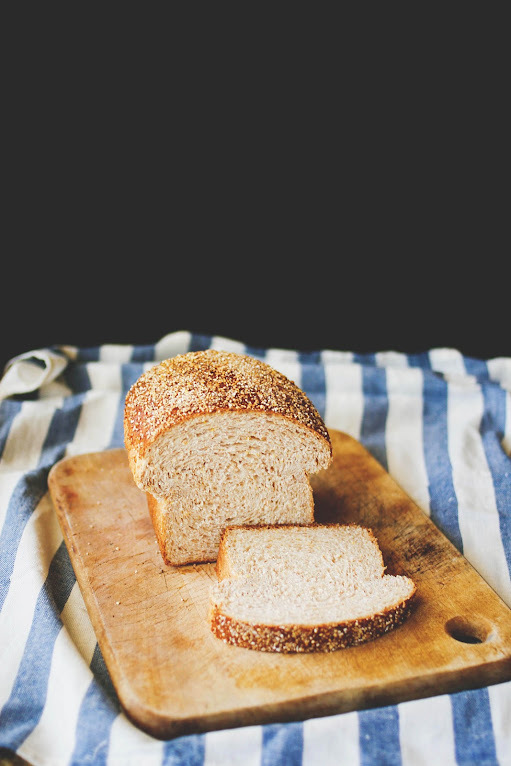 This recipe is something I kind of developed from my favorite, favorite milk bread recipe. The Tangzhong method keeps it soft for days as it always seems to magically do and then 10 grains make it hearty and perfect for sandwiches. 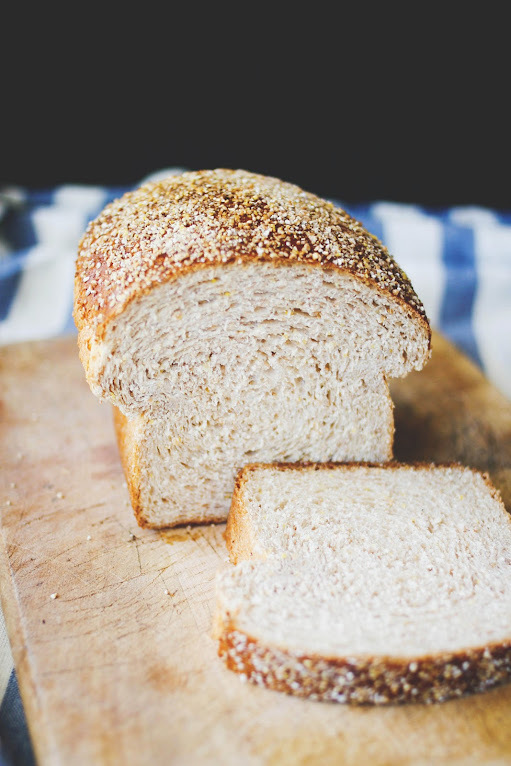 Speaking of... delicious sandwich made from this 10 grain bread to be posted very soon! To make the tangzhong, mix the flour and water together and whisk until it is completely dissolved and there are no lumps. Pour into a small saucepan and heat over medium heat. Begin stirring constantly as the mixture heats up - it will begin to thicken. When the temperature of the mixture reaches 150 F, turn off the stove and remove it from the stove to let it cool. In the bowl of a stand up mixer, combine the flours, cereal mix, salt, sugar and yeast and mix. In a large liquid measuring cup, combine the milk, egg and tangzhong and mix very well. Form a well in the center of the dry ingredients, then pour the wet ingredients into the center. Fit the mixer with the hook attachment and begin mixing on medium speed until the dough comes together, then add the butter in and continue kneading. Knead until the dough is smooth, not too sticky on the surface and elastic, about 18 - 20 minutes (but each mixer varies). When ready, you should be able to take a chunk of the dough and stretch it to a very thin membrane before if breaks. When it does break it should form a circle. Remove the dough from the mixer and knead into a ball. Take a large bowl, grease it with oil, then place the dough into the bowl and cover with a wet towel. Let it proof in a warm place until it's doubled in size, about 40 minutes. Once the dough has doubled in size, transfer it to a clean surface. Roll out the ball with a rolling pin into an oval shape. Take one end of the dough and fold it to meet the middle of the oval, then take the other end and fold it to meet the middle. Flip the dough over with the folds facing down and flatten with a rolling pin. Roll out the dough until it forms a thin rectangle. Begin rolling up the dough along the wide/ long side of the rectangle so you end up with a long skinny roll rather than a short and fat one. Place it into a 9x5" bread pan lined with parchment paper. Cover in plastic wrap and let rise until doubled in size, about another 40 minutes. Beat an egg and brush the mixture on top before baking. Bake at 325 F for 30 minutes or until golden brown. YUM i can't wait to make this! Oh my, I love your photos, they're so beautiful! And I can't wait to try this recipe :) And I'm definitely adding your blog to my Favorites. Mmm, your bread looks beautiful. You really mastered the tangzhong breads. How did you get the shape? Oooh, yum! This bread looks so soft and delicious! @ nailspotting: thanks! i love your blog too - already a follower! @ davenport dreams: it is! amazing, amazing bread! I'll have to try this tangzhong method because this looks so perfect! I don't usually buy eggs though so I wonder if I could still make this recipe work.